JPACT came together this morning to green light $16.8 million in federal grants for active transportation projects. A Metro committee unanimously approved a $70.7 million package of federal “regional flexible funding” at a meeting of their Joint Policy Advisory Committee on Transportation (JPACT) this morning. 14 projects (totaling $22.9 million) — including $2.0 million for the Portland Bike Sharing Project — were included in the passed resolution. But prior to the vote, there was a heated exchange between Mayor Sam Adams and Multnomah County Commissioner Deborah Kafoury. It came after two citizens gave testimony to the committee about concerns that equity considerations and public input around the bike sharing project has been inadequate. Kafoury supported the concerns and tried to delay a vote on the project, while Adams spoke up in its defense. 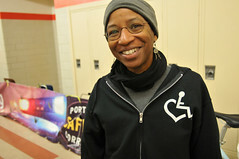 The two people who testified were: Alan Hipolito, representing the Native American Youth Center, the Urban League of Portland, and others; and Carla Danley, a citizen activist who also sits on the City of Portland Bicycle Advisory Committee. Hipolito requested that a set of conditions, what he called an “equity agreement”, be agreed to before any further action takes place on the project. One of the key issues of concern for Hipolito and others is that the bike share program will only benefit downtown Portland, and not outlying neighborhoods (this isn’t the first time we’ve heard opposition to this project on those grounds). There has been some talk of extending the rental kiosks and stations into neighborhoods, but so far no commitments have been made. 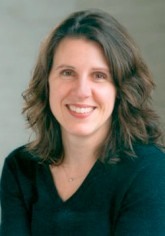 After that testimony, Multnomah County Commissioner Deborah Kafoury spoke up in support of Danley and Hipolito. After Metro staff advised that it would be better to pull out just the bike project from the rest of the projects in the resolution, Mayor Sam Adams responded to Kafoury’s motion. 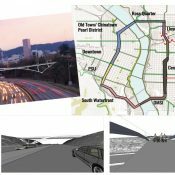 “The fact that this project is controversial is that projects of this nature are controversial before they’re implemented, much like other transportation innovations — whether that be streetcar or light rail or bikes in general… When we’ve done them the first time, locally or nationally, they’re controversial. On this particular project, you’ve got downtown that’s 52 times above the DEQ ambient requirement for air quality. Some of the most poor and diverse census tracts in central Portalnd. I have to say that’s kind of gutsy. I understand folks don’t like this project. Fair enough. We agree to disagree. This is, in addition to serving cent Portland, this serves PSU and will give free and affordable ways for people to get around that don’t have opportunity to take their bike from other parts of the region as they attend college. It gives people who are low-income to have the ability to move around on bikes downtown that right now they don’t have the financial ability to do. “This project doesn’t even have an RFP yet. Our record at PBOT — as evidenced by the allocation of resources you’re voting on today — where half of them, over half if you take out freight, is going to east Portland, that is evidence. It is very disingenuous for you to try to portray otherwise when the RFP isn’t even written because we don’t have the funds for it. 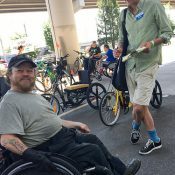 So, our ability to address this further remains ahead and I’m happy to submit a motion if you want on bike sharing that we’ll continue to meet with environmental justice folks and try to work out something… But the folks that don’t want this to happen at all, I’m not going to satisfy them if this moves forward. After that defense of the project by Mayor Adams, JPACT Chair Carlotta Collette asked if anyone would second Commissioner Kafoury’s motion. No one responded. The original resolution then passed unanimously. With today’s vote PBOT can now draft a request for proposals to hammer out the project details and find a bike share system vendor. For more background on the bike-sharing project, see our past coverage. I’ll post a separate story with details about the flexible funding process and other projects that were included in today’s resolution. I’m still skeptical that bike share is such a priority here/now. Is it a symbolic thing? Because I still haven’t heard/seen/understood who is expected to shift from a car/fossil fuel mode to a shared bike, what kinds of people and trips this project is going to affect. We had these discussions here when this came up before, and I don’t recall much in the way of substantive insights from the projects defenders on these questions. Or I may have missed them. I fully support the implementation of bike-share. However, I think Ms. Kafoury is right on that it’s possible to be pro the plan, but possible to address the equity aspect at the same time. For instance, I think the ability for folks with low-income to move around downtown by bike would be AWESOME. Yet, it seems like all the early chatter I’ve heard is that the system will require a credit card. Um, most of my low-income clients downtown, who live in places like SROs and HAP housing, don’t have credit cards. Many of these people are on SSI benefits, which top out around $700 a month. Sam’s assertion that these issues have pretty much already been dealt with, seems fallacious at minimum. I think you bring up a good point about access to the system, because I think there will undoubtedly be people without a credit card who could and would benefit from it. My limited understanding is that the primary rationale behind the credit card is not a preferred method of payment, but the financial liability should the bike be stolen, vandalized, or otherwise significantly damaged. That said, I don’t see why PBOT couldn’t write something into the RFP that requires the vendor to provide an alternate form of payment and liability. This could be done through any number of partner organizations. It could also operate in similar way to TriMet passes, where individuals who meet certain criteria are allowed reduced-rate access to the system (a la Honored Citizen or Youth passes). I’m glad the city is ramming this through. It will transform the world and will not be a boondogle. Just look at other cities. The main thing we need to get is a sponsor willing to put up 3-5x matching dollars so the system can expand well outside the downtown core. Unless you are being facetious, I don’t find this helpful. Please tell me/us what you see in other cities that makes this such a sure bet? And for whom? Where are they assumed to be coming from/going to? What modes are these shared bikes assumed to be coupled with? Who is going to be switching from a car to a bike? If that is the claim? If it is not the claim, then please tell us what is the core claim and reason why spending goodly sums of money on this is money well spent? I saw tourists and students mentioned. And that it was “popular.” I’m open to this being a fantastic direction in which to move. But so far I’ve not understood specifically how it gets people out of/unused to cars and what other modes they use to complement their shared bike trips. Who are the 2,319 Annual Subscribers? The article didn’t say. Seville is the most famous example, but the Boris bkes in LDN and the Paris Velibs have all been transformativly succesful. Bike around Paris now is actually almost pleasant now. Bike share also helps politically by making any improvements to bike space an improvment for everyone. I’m pretty excitd for more bikes to be on the road downtown. As Tom Miller and many others have pointed out downtown has much lower bike rates than the neighborhoods that surround it. On the other hand I also opposed using these funds for bikeshare. I second Ms Danely’s concerns about the concentration downtown. It’s a bit ridiculous that the most bike friendly parts of the city (Inner SE/N/NE) that you’d want to visit wont have bike share. I still think money for bike share really ought to be coming from TriMet. If they’re gonna cut the bus lines this much we should at least have alternatives. Someone stole my login name. Adams seemed to allude that this bike share would be free? Is that actually true? I don’t understand wanting to start this all over the city first. Honestly how long of a distance will people ride bike share bikes? 2-3 miles max would be my guess. I don’t really understand having stations in outer east side? This is an area that is mostly made up of homes/housing. I think the bikeshare group is assuming that you start with the most dense part of a city first, a place where people take short trips. That would be downtown. I just find this “equity” issue (do they mean “equality” by this? ), a bit odd. I sent JM an email…your login pre-populated my comment window. Sorry I didn’t notice but I just did a quick copy and paste and post. Bike sharing folks better watch out or they are going to get tickets for riding on the sidewalks. What the heck is a “community of equity”? What the heck is “equity review”? Many of the example cities have far more jobs in the cores where the systems are. This increases trips and attracts outside residents to come to the core and use the system. Also, many of the cities had poor mode splits to start with and therefore could tap a more willing base to start riding. Safe infrastructure (or perception its safe) is the final piece. Downtown is a pretty eat-or-be eaten bike environment with rail, congestion and large oneway streets. Aside from Oak/Stark there are no bike facilities that span downtown. If these are needed for sharing – it needs to be in the budget. I hope it works, but I wouldn’t put my own money down on it. Let the feds do that. Paul, perhaps you don’t pay federal taxes, but many of us do. That too is *our money*. As noted in this post, organizations such as Verde and private citizens like Carla have not been shy about voicing their concerns regarding the Bike Share investment. And they have been doing so for months. It’s unfair that this project was the only one called out and we shouldn’t take any action because we have failed to take action in other cases. I commend Commissioner Kafoury for not taking the Mayors’ bait and defending the expectation of citizens to have they concerns they raised about project be formally addressed. It is a shame that the other commissioners didn’t show the same resolve. given chronic underinvestment in the periphery this is the wrong time to be investing in another major program that largely benefits wealthy citizens and businesses. kudos to kafoury for allowing discussion of the equity issue. I’m pretty surprised at the amount of comments from people saying “what is equity?,” etc. In a progressive city like portland, equity should always be at the forefront of major decisions. The most off-putting part of this article is the way the Mayor handled the situation. The whole “your projects didn’t go through an equity filter either” retort makes him sound like a 5 year old. She asked for a motion to suspend the vote for ONE MONTH to look at equity because citizens had raised the issue and he got pissed? Because he might not get his way? Ugh. Is bike sharing awesome? Yes! 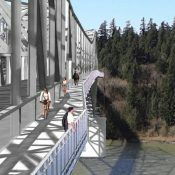 Is it the best use of our limited funding for local active transportation projects? Probably not. 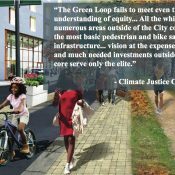 Does it fit within Metro’s own stated goals of funding projects that specifically address equity as the other projects clearly do? No. Thank you to those who care deeply about equity AND transportation yet had the courage to point out the sincere flaws in this proposal and the process surrounding it. Situations like this really test how committed we are to dealing with neighborhood-level economic justice. It is one thing to say we care about equity, it is another thing entirely to follow through. With pending budget cuts at PBOT, people like myself who may have been initially pleased with Nick Fish’s effort to commit the city to funding Barbur and Sullivan’s Gulch anyway, I think we’re in for more disappointment. Thank You Mayor Adams and JPACT. Yes, I thought Adams handled Kaufory’s ambush very well. As to the credit card requirement, there has to be a way of holding people accountable for the bike they borrow, or this just turns into another yellow bike fiasco. I haven’t seen any ideas on other ways to do this, anyone have any good ideas? Ultimately, I don’t think the Mayor or PBOT used the many months before Kaufory “sprung her trap” to actually come up with some solutions or address these concerns in any concrete way. So, I’m sorry but I don’t agree that the Mayor handled this “ambush” well. Offering a lame excuse to continue to ignore these concerns is hardly grace under fire. Pants on Fire – Adams downright lied about Multnomah County’s projects not being assessed through an equity filter. Both its Active Transportation and Freight projects ranked very high using Metro’s Flexible Funds equity criteria. These projects, located in Wood Village and Fairview, will build sidewalks and bike lanes in low-income, ethnically/racially diverse communities, and provide community education and outreach to the many non- English-speaking residents of the area. I forgot, thank you city council. I forgot you endorsed this too. Two thumbs up. Others will figure this out in another couple of years. Until then thanks for having some forward vision for all of Portland. Wow! I got on this morning(friday) thinking that no-one would be talking about this. Without knowing all the issues surrounding the final discussion on the bicycle part of the federal money, I just want to say that it seems to me that all to often someone comes to the party with unmet expectations and wants to hold off the outcome. What Im not opposed to is everyone joining in the process EARLY, while it may seem that may have been tried and sidestepped, how many of us know all to well that we have to be consistant and constant with our input to have any success with government agencies. While it seems that at this juncture not all parties got served, we could all get behind finally having the option of another form of transportation besides cars. P.S. Lets not forget that in Paris, they had someone who did not like bikes, and after they were installed and in use decided to sabatoge the bikes. Vigilance! 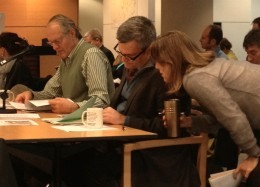 Portland Bike Share is proposed to be added to the Regional Transportation Plan (RTP). This is necessary for Bike Share to receive regional flex funds approved at the Dec. 8th JPACT meeting. The Metro Council must approve the project list, including bike share, before the 2014 – 2015 flex funds will be allocated. Please take advantage of the Metro comment period, open through Jan. 5, 2012.